For Christmas I received a kit to make chocolate dome! Awesome gift! I wanted to make these dome since quite some time. As I really enjoy watching cooking competition shows like Masterchef, Top Chef, or the The Great British Bake Off (the french version), I've seen many times beautiful chocolate pastry. A few weeks ago I opened my kit, which contains a few mini bols in inox, a cookie cutter, a brush and a small recipes book. So I looked one of the recipe to make chocolate domes. Unfortunately some details about how to make the dome were missing. So I tried a few times, many times, and I finally come up with a good result. 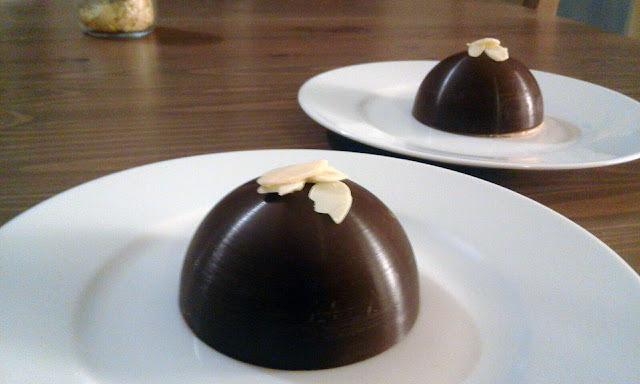 Here is my recipe to make chocolate domes with chestnut mousse. 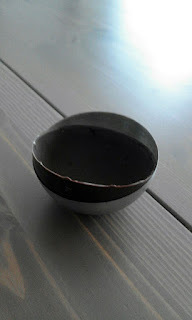 Here's all my tips to make sure the chocolate does not stick to the bowl and does not break when you unmold you desert. Put 2-3 cups of water to boil. During the time the water is getting hot, brake your chocolate into pieces and put them in the small bowl. Pour the hot water in the big bowl and put your small bowl in the big bowl. Make sure no water goes in the small bowl where the chocolate is. The best is to leave it without touching the chocolate until it melts for maybe 15 minutes maybe a bit more it depends of your bowls and the quantity of chocolate your are melting. Then there's the tricky part. Having your melted chocolate at the right temperature. Professionals seems to say that between 28 °C and 29°C is the right temperature. If it is under this temperature your chocolate will be to thick and difficult to work with and if it is above, it will be to hot to crystalize (not sure it's the right term) and it won't come off your little bowls it will stick to it... It also depends on how quick you are to make your chocolate dome. I prefer to use my chocolate at 29,5°C. I use thermometry to help me to know which temperature the chocolate is. But in all cases when your chocolate is melted take the small bowl out of the big bowl and start mixing the chocolate until it doesn't feel warm. You can check with your finger, it should not be cold or warm. At this point, your chocolate is ready. You put half in each of you little inbox bowl. You than need to take your mini bowl and make sure chocolate is covering the whole inside. Than you put these mini bowls upside down on a grid and tap with a spoon all over it to make sure all the exceeding chocolate comes out. It's quite technical so here is a video to show you how I learned how to make chocolate domes. 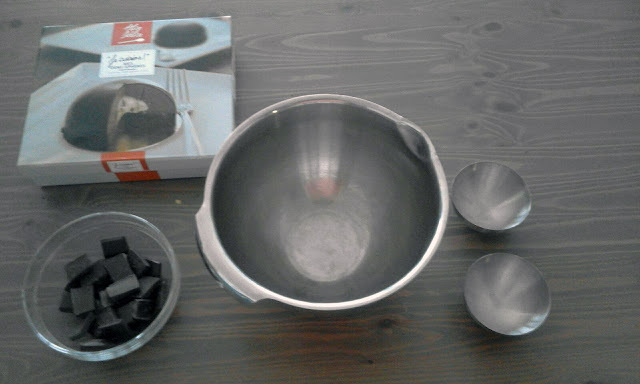 When you are done, you will need to put your dome in the fridge for minimum 2 hours, really 2 hours if you don't wait, it is quite difficult to pull out your chocolate domes from the mini inox bowls. To pull them out, you just need to put one or two fingers on the chocolate and try to make it slide out. No need to take them completely out, as we still need to fill them. You will need to soften the gelatin in the cold water and heat a little bit the 3 table spoons of chestnut in the casserole. When the chestnut is warm and the gelatin soften, add the gelatin in the casserole and remove it from heat. The gelatin should melt with the chestnut. Let it cool down. Wipe the cream. When the cream has a solid consistence avec the chestnut, mix it. Your chestnut mousse is ready! 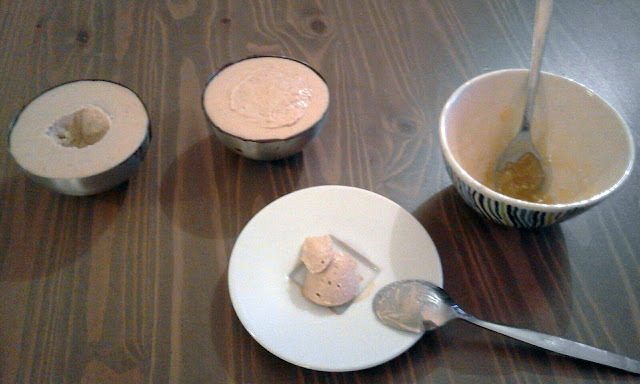 Fill your chocolate dome with you chestnut mousse and wait 1 hour. Then if you want you can make a hole with a coffee spoon in the middle and add some pear jam and close the whole with the mousse you've just removed. Put it back in the fridge for 30 minutes. It is ready to serve! Hmmmmmm !! Ca a l'air booooon !!!! Très bonne recette, merci ! j'adore le coeur avec la confiture de poires (mélangée à un peu d'alcool de poires). On peut aussi la remplacer par de la confiture d'oranges ou clémentines, ça va très bien avec la crème de marrons et le chocolat.